10 Year Treasury Rate Forecast: Where to Next? 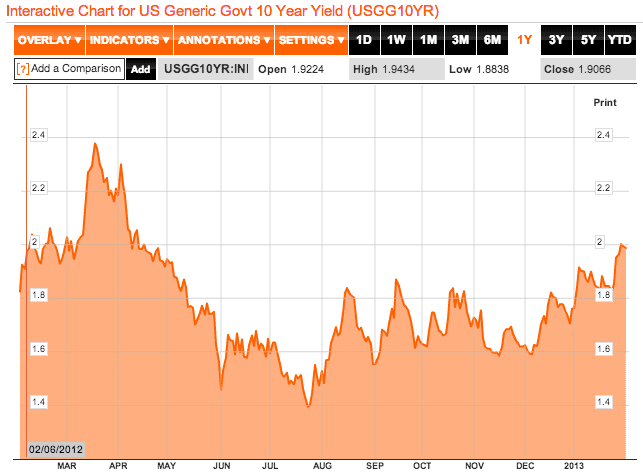 The 10 Year Treasury Rate: Where to Next? As of July 5th, the 10 year treasury rate is 2.71%. One month before, the rate was 2.09%. While rates have dramatically increased in June / early July 2013, it is far away from where it was trading in the beginning of 2011 when rates were a tad below 3.5%. 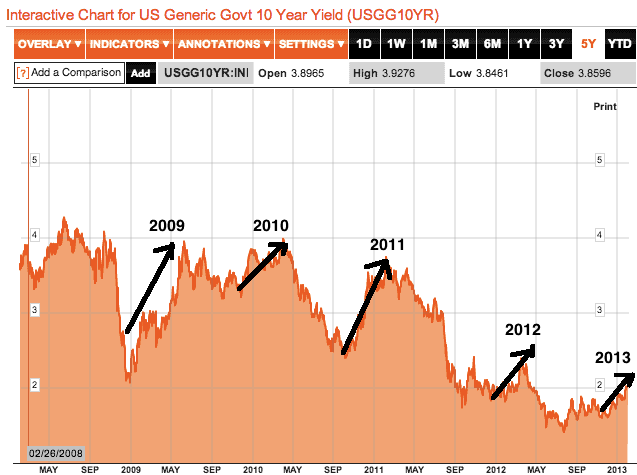 In fact, on the graph of the 10 year treasury below it doesn’t look like the rate has even broken its downward trend. Where is the 10 year rate going from a technical (charting) perspective? Lets say that you knew nothing about the fundamental reasons for the 10 year interest rate moving and only had the chart to use for forecasts. What conclusions would you make? If you drew a line from the highs in 2007, 2010 and 2011, the line would be right around where the 1o year treasury rate is currently trading. A trader focused on charts would expect there to be some resistance to the rate going higher based on this trend. If this line was broken and the rate moved higher, the next major point where rates seem to have resistance is all the way at 4.0%, which 10 year treasury rates flirted with but could note make a sustained move above from 2008 – 2011. Where is the 10 year treasury rate going from a fundamental perspective? While most people expect that over the next 5 to 10 years rates will be rising, the question is the timing of rising rates. Since 2009, The Federal Reserve has done everything in its power to lower interest rates in general, and long-term rates in particular. The FED has been buying 85 billion dollars worth of bonds per month (aka QE3) pushing down yields, switching its portfolio to hold more long-term bonds (QE2) and setting short-term interest rates (FED Funds Target Rate) a smidgen above zero. However, the market knew that all of these drastic measures had to end eventually. The recent rise in rates reflects the market’s view that the FED will be reversing course soon. For the FED to reverse course, the economy needs to be strong. While the FED has started to talk about a time when they will stop buying bonds, this is based on the unemployment rate starting to head towards 6.5%. Gross doesn’t think that unemployment will reach 7% in the next year. If he is right, it will tough for the FED to argue that the economy is strong enough to change policy. The FED has said it has an inflation “target” of 2%. With inflation closer to 1% than 2%, the FED will have a hard time arguing that changing policy makes sense from the standpoint of creating price stability. There has been too much focus on the FED stopping its purchase of bonds and not enough on the FED’s position on short-term rates. The FED has said that it will keep the FED Funds Target Rate stable (between 0.0 and 0.25%) for some time after it stops buying bonds. With short-term rates effectively being zero, there is only so far that the 10 year treasury rate can rise. The question which Bill Gross doesn’t ask or answer is why would anyone want to own a 10 year treasury that pays 2.0% or 2.2%, when they can own a high quality stock with growth potential that consistently pays a dividend of 1.5 – 2.0%. Over the last few years, the answer to that question has been the relatively safety and security of treasuries relative to other investments. However, with a change in FED policy inevitable (whether its 1 year or 3 years down the road, Treasuries now look like a risky investment. However, I do believe Bill Gross is right in that many are predicting a change in FED policy too soon. Learn Bonds prediction of the 10 Year Treasury rate for the next year is between 2.0% and 3.0%. Below is an older article we published with the same title in February, 2013. I have kept article because I think it illustrates an two important points. The 10 year treasury rate tends to shoot up and then come back to earth in an almost annual cycle. Typically, this process happens near the end or beginning of the year. The recent dramatic rate move does not correspond to this seasonality. So far 2013 has been an exciting year for the bond market. Junk bond yields have dropped below 6% for the first time ever, while at the same time the yield on the 10 year treasury has moved significantly higher. With this in mind, I thought it would be constructive to have a look back at what we can learn from this, and what insight current price levels may give us into future price action. As you can see from the below chart, the 10 year treasury yield has been on a steady march higher since late December, recently crossing back above 2% for the first time since April of last year. What caused the rise in yields? In my opinion there are several different factors, however all of them relate either directly or indirectly to the Fed. If you pay much attention to the news this may seem counterintuitive, as everything you read says the Fed’s intervention into the market is keeping rates low. As I explain here however, this is not actually the case. In September of 2012 the Fed announced unlimited quantitative easing, and that they were increasing the amount of treasuries and mortgage backed securities that they were buying to $85 Billion a month. What really got the market moving however was when they announced that they would be specifically targeting unemployment, with the goal of continuing their intervention into the market until the unemployment rate drops below 6.5%. This increased the market’s inflation expectations, sending rates higher. The “resolution” or at least kicking of the fiscal cliff can down the road also played a role, as it removed a level of uncertainty from the market early in the year. All of this, combined with a more stable situation in Europe, has investors in a “risk on” mood. When this happens money flows out of bonds and into stocks, sending bond yields higher (their prices lower) and stock prices higher. The bursting of a bond bubble? Just because the market has done something in the past is certainly no reason to think that it is going to continue to do so. However I do think it helps put the recent move higher in rates into perspective. There is no doubt that with rates so low the risk is to the upside. However, this has been the most euphoric start to the year that I remember since the financial crisis, and we have seen around a 25 basis point move in the 10 year treasury. Since the mood of the market is already so elevated, I am skeptical that we are going to see things become a lot more euphoric in 2013 than they already are. Although the situation here in the US and Europe has certainly improved, there are still many dangers lurking in the shadows. While I hope I am wrong, I suspect that one of these dangers will rear its ugly head in the relatively near future, putting a near term cap on both stock prices and the 10 year treasury yield. With this in mind I anticipate that we will likely spend 2013 bouncing between the 2.20% and 1.80% levels. This means that while there will be some opportunities for traders, the long term investor is likely to find better value elsewhere. For more reasons why I do not think there is a bond bubble go here. So, now that “I anticipate that we will likely spend 2013 bouncing between the 2.20% and 1.80% levels” is out the window, what do you say now about bond bubbles? Just reminding readers that, on the last chart, rates are suppressed by massive QE1-QE4. Going forward, when the Fed start tapering or stopping QE all together, the rates will go higher. 4% is what I think the market demands. Thank you, David, for expressing your opinion clearly. Most of the articles and opinions of financial institutions I’ve read so far are very unclear about what they are actually trying to say. We are in the airline industry, aircraft delivery is in October, pricing depends on 7 years UST. We have an option to fix now or wait until October or even during a year after the delivery. Since second half of June UST went up signigicantly, does not look like now the 10 years UST would go down to even 2.2? Bonds with an average duration of 10 years. With the abrupt increase in rates in late May, my portfolio is down $28,000. This loss happened in about six weeks. This is my life savings in a 401K. I invested my money in October of 2011. Recently, I tried to sell but my loss would have been greater selling on the secondary market. Other experts feel the 10 year will pull back in the next few months. After reading your article, I will wait. You comment. Thanks! Excellent article. What would you estimate to be the probability of a 10% gain over the next year if I invested now in TBF, the inverse of the treasury bond? Charting the mirrored TLT vs TBF, it would seem that TBF has a bright future over the next several quarters.